It is time to celebrate 30 years of Vera Bradley! August 7th is the VIP party, an invitation was sent out with two tickets inside to spin a prize wheel and August 8th is the all day celebration. All Day Boxy Tote $84 (reg $112) Buckle Tote $74 (reg $98) Both are available in three new Fall colors, PLUS three additional 'sneak peek' colors (not available in stores until September 19) Open to 3pm Purchase any style and receive 50% off a second style of equal or lesser value. 3pm to Close 25% off your entire purchase Enter for a chance to win a $150 Vera Bradley shopping spree. 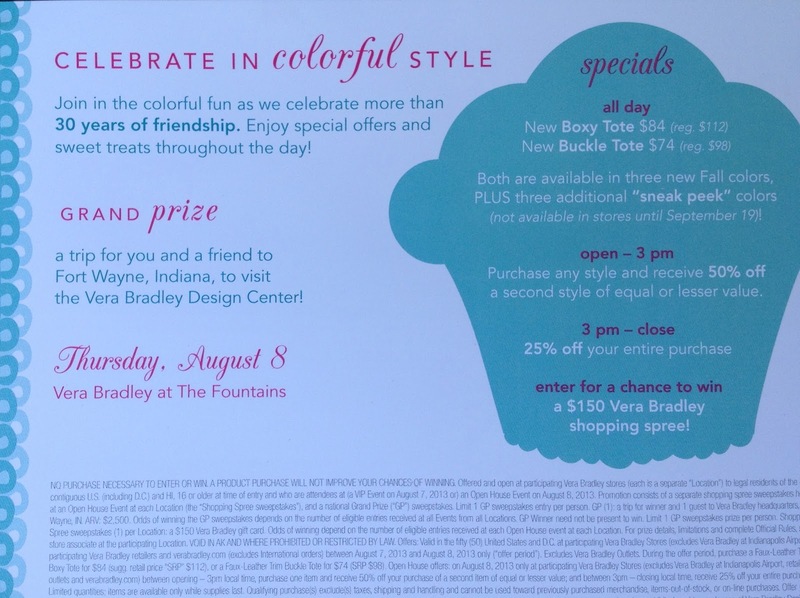 Grand Prize A trip for you and a friend to Fort Wayne, Indiana, to visit the Vera Bradley design center. The Boxy Totes might be on sale online, but the other sales throughout the day will just be in stores. Can you get the same discounts the same on Wednesday as Thursday ? Or is it better to go on Wednesday if you can go and have an invite . Plus any idea what the buckle tote looks like ? Thanks ! The VIP parties are always worth going to! And today's post has a photo of the Buckle Tote. Are these deals at any Vera Bradley store? Only the official stores? only at particular stores? These will be at Vera Bradley stores, not other retailers. Do you know what the 3 sneak peak colors are?